Colourmaster NIP are now able to supply black masterbatches which offer infra-red detectability for recycling of plastics. Manufactured by Clariant, the CESA®-IR range, has been developed to replace the traditionally used carbon black based masterbatches in packaging applications. Traditionally black masterbatches have used carbon black as a colourant due to its excellent colour strength and dispersion. Unfortunately, in a recycling situation, this property makes black packaging difficult to detect and sort out during the recycling process because it covers the polymer spectra during detection. 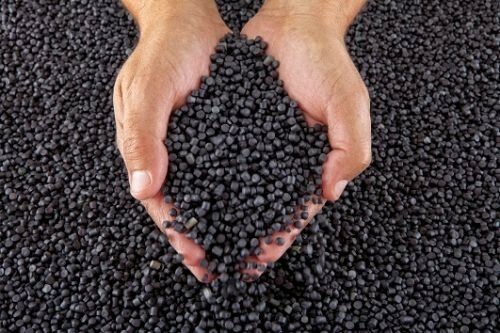 Consequently, black packaging cannot be sorted into its different polymer streams and is diverted into a mixed polymer stream of residual waste, and, therefore, not recycled. CESA®-IR masterbatches replace carbon black with colourants which do which allow the polymer grade to be successfully identified. This enables the polymer to be identified using current detection methods, which means the polymer can be sorted into polymer type and then directed into the correct stream for proper recycling. Available in grades compatible with PP, HDPE, PET and C-PET (with more in development) CESA®-IR features a colouration strength and dispersion quality on par with conventional black masterbatches, very good processability and a competitive let-down ratio.